@Holzgerlingen | Get Your Grub On! Oh, I just have a salad! A spontaneous invitation from friends brought me to the beergarden at the old train station in Holzgerlingen today, the town I went to high school in. 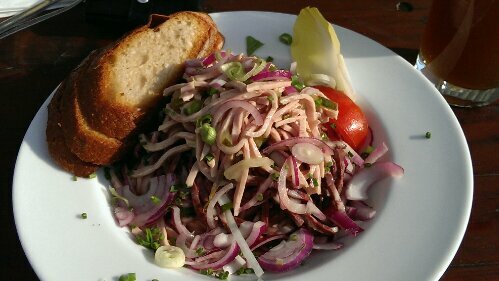 They offer the usual beer garden fare and as I wasn’t that hungry my choice fell on something “light” , ‘Schwaebischer Wurstsalat‘ (Swabian sausage salad) which was a slight variation to the sausage salad I had about a week ago in Freiburg. For the Swabian version they used slices of black sausage additional to the lyoner. The two types of cold cut sausage tasted good and were seasoned well but for my taste the blood sausage was too soft as I prefer it with a little bit more bite. The dressing was nice, slightly sour and a bit too oily. There were sour pickled gherkins that added extra flavor and the chopped red- and spring onions gave it all a sharp kick. The beer garden at ‘Alter Bahnhof’ is self serviced and offers simple but good food to reasonable prices and is a nice hangout for a sunny afternoon and for those who prefer a less casual ambience there is the waited restaurant area only a few meters away.